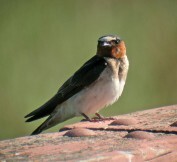 A construction project on Highway 101 in Marin and Sonoma Counties is taking a toll on nesting cliff swallows. Environmental groups are suing Caltrans to remove a net that's trapping and killing some of the birds. The netting on the Marin-Sonoma Narrows project near Petaluma was intended to keep swallows from nesting on the overpass during construction. Instead, the net is entrapping them and birds are dying. Carter Dillard, the director of litigation for the Cotati-based Animal Legal Defense Fund said the net, which has been up since late March, violates federal law, and the suit demands that Caltrans remove it. "The law was passed to protect wildlife that are an integral part of our ecosystem," said Dillard. "There's no excuse for killing these animals, and they're dying in horrific ways. The agency should simply take down the netting." So far the netting has claimed more than 100 swallows, according to Dillard. His group filed the lawsuit in federal court on Friday on behalf of five conservation organizations. The Migratory Bird Treaty Act prohibits killing migrating birds. A Caltrans spokesman said the department has a policy of not commenting on pending litigation.